After leaving Dave and taking a perpendicular out to 191, the clutch on the F800GS was getting worse and worse. My thought was that if I could get it up to speed slowly and carefully, I would have enough friction to keep the bike moving and could get to somewhere with cell connection where I could see what the folks in "Beasts" thought about my predicament. Losing about 10 mph every 5 miles of the 20 mile ride up to I-70, I literally coasted into World Famous Papa Joe's Stop & Go in Crescent Junction, where 191 runs into I-70. Still trying to be optimistic, I parked the bike in the shade, got a snack and a drink and settled into a comfy patio chair with 3G coverage where I could post Help! F800GS clutch slipping - stuck near Green River, UT. Around that time, I heard from Dave who had made it to Green River via the TAT and was waiting at the Motel 6 we'd agreed upon with the help of the Zumo. I was telling him that I was still evaluating the situation when Ann called to say that her flight had been cancelled out of Moab and they were figuring out whether they'd put her up in Moab for the night or try to get her to Grand Junction. The three of us settled in to see how the chips would fall. Within 20 minutes, the good inmates of ADV started responding and helping me think through some possibilities. I also ran into a guy on a K1200 who turned out to be a motorcycle mechanic. He mentioned that the clutch springs can tend to stretch and fatigue under extreme heat and that was his guess. So they'd recover after some time in the shade right? No. I hopped on the bike just in case. Now, I could let the clutch completely out in first gear and while it would pull a little, it wouldn't stall. Bad sign. Time to make use of my BMW roadside assistance which despite being comically uninformed about my VIN, motorcycles in general, and the name of the "town" that seemed to made up wholly of Papa Joes, managed to put me in touch with a guy named Ray who would be out with a trailer shortly. 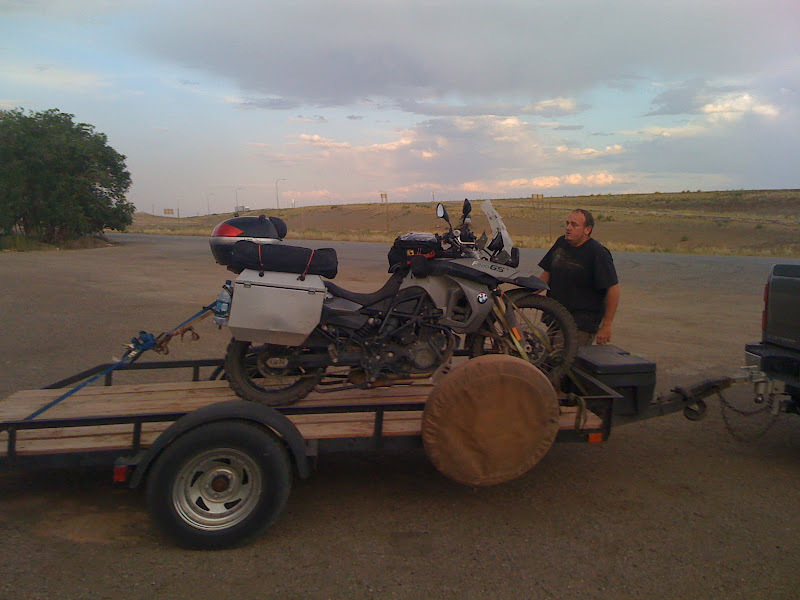 We confirmed that BMW would cover getting the bike to the nearest dealer in Grand Junction but since they were closed on Sunday, that it would have to be stored in Moab and brought up there in the morning. When Ann called to say the airline was paying for a night in a motel in Moab, the plan came together and I hitched a ride with Ray and the bike into town. Dave would continue west on the TAT and I'd try to catch back up with him on I-70 from Grand Junction once the bike was fixed. Ray turned out to be a very interesting guy. We talked about our trip, his recoveries of flash flood ravaged jeeps down Kane Creek, pole barns, hot rods and who knows what else before he dropped me in front of the Moab Valley Inn and we agreed on a 7:00 am departure for Grand Junction. Within minutes Ann and I were crossing the street to the Moab Brewing Company for some beers and dinner. As soon as we walked in, we recognized the group in front of us as the French tourists in the Toyotas who'd let Ann soak up their AC in the final miles of the WRT. With an exclamation of something like "Se vive!" we knew they were happy to see she made it. Turns out they'd decided to turn around when the road got ugly as we'd warned them it would. After Ann and I had downed the beer sampler platter and a pint each of our favorite, we decided to send a bottle of wine over to the French group's table with a Moab Valley Brewing Company bandana tied around it. Hey, we owed them a replacement for the bandana the one guy had given to Ann. We watched the waiter walk with it towards the table, then suddenly turn and put it down on the table next to them who were very excited by the unexpected gift and proceeded to tie the bandana around the father's head and generally make merry with our wine! When we explained to the waiters that they'd brought it to the wrong table, they were horrified and apologetic. We took matters into our own hands, arranging to cover the three pitchers of beer they'd ordered and hand-delivering another bandana. They were so surprised and thankful and insisted on taking about 100 pictures with us. As we walked away they were each posing for more pictures with the bandana. They'd really helped us be more comfortable on the trail and it felt good to see them so happy. 'Course, by then we were feeling pretty loose, having been nervously sipping on pints while this whole thing was going down. We crashed after a long day in limbo, anxious to see what the next day would bring.